Heat oven to 400°F. Spray large dark cookie sheet with Crisco® Original No-Stick Cooking Spray. Unroll dough on cookie sheet. Bake 8 minutes. Meanwhile, in small microwavable bowl, stir preserves and mustard until well blended. Microwave on High 20 to 30 seconds or until melted. Sprinkle chicken over partially baked crust. Drizzle with apricot-mustard mixture. 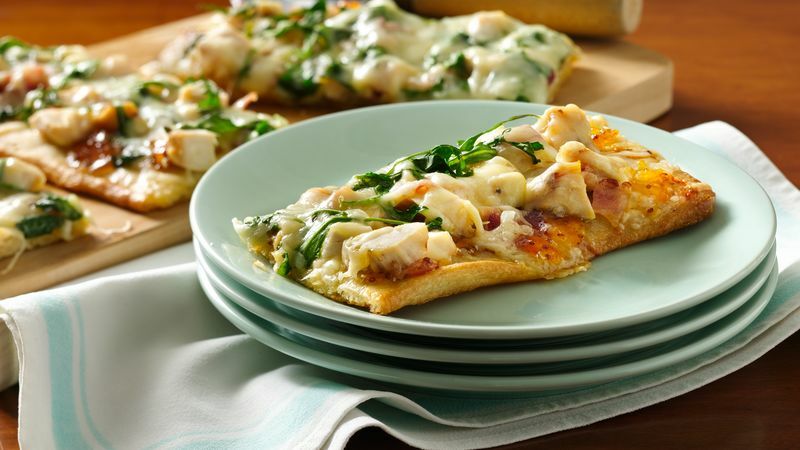 Top with bacon, 1 1/2 cups of the cheese, arugula and the remaining cheese. Bake 8 to 10 minutes longer or until cheese is melted.